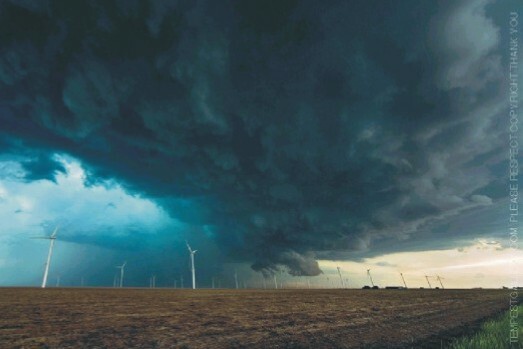 A tornadic supercell rips through a wind farm near Dodge City, Kansas. This mind-blowing photo was taken by my dear friend and stormchaser extraordinaire Stephen Locke. Courtesy Tempest Gallery.© 2010 Stephen Locke. Most tornadoes are short-lived, averaging about 30 minutes on the ground. The "Tri-State Tornado," which tore through parts of Missouri, Illinois, and Indiana on March 19, 1925, holds the record for the longest path length (219 miles), longest duration (3.5 hours), fastest forward speed for a tornado anywhere on earth (73 mph), and most deaths (695). Highest wind speed ever recorded: During the F5 tornado that moved into Oklahoma City on May 3, 1999, a Doppler On Wheels situated near the tornado measured winds of 301 +/- 20 mph momentarily in a small area inside the funnel approximately 330 ft above ground level. An average tornado is about 500 yards wide. The widest tornado (defined as damage path, not condensation/debris cloud or radar measurements) on record is the Wilber-Hallam, Nebraska, tornado during the outbreak of May 22, 2004, with a width of 2.5 miles at its peak. A group of tornadoes moving along the same general path is called a "family." Exceptional tornado coincidence: The small town of Codell, Kansas, was hit by a tornado on the same date three years straight. A tornado hit on May 20, 1916, 1917, and 1918. The U.S. has 100,000 thunderstorms a year; less than 1% produce a tornado. The odds of this coincidence occurring again are extremely small. Exceptional tornado survivor: Matt Suter of rural Fordland, Missouri, holds the record for the longest known distance traveled by anyone picked up by a tornado who lived to tell about it. On March 12, 2006, he was carried 1307 feet (398 m), according to National Weather Service measurements. "There's No Place Like Kansas." A tornadic supercell strikes Wichita, Kansas. 5" x 7" oil on copper by David Smith.